Nothing excites me more other than having a good dish in the middle of the table, a pair of utensils to use and good friends to share it with. Such is the case in one glorious lunch at LuGang Cafe, San Juan. this dish is particularly good... that is based on my friends expressions as they were munching on this, just to let you know, I am not quite fond of Tofu as well as century eggs, but I guess they were happy with this... lastly I wish they had not used the word "preserved" for the egg... just my opinion though. Pineapple fried rice, this is actually good, the pineapples and cashews not just gave the fried rice a good presentation it also give the fried rice flavor, yes many chinese restaurants already serve pineapple fried rice, so why should you order this? because the flavors of the pineapple and cashew nuts gave it a unique taste like no other pineapple fried rice that I have tasted.... sweet and tasty, really good. 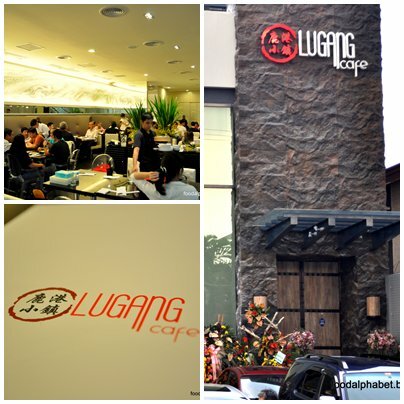 It was quite a lunch, and yes Lu Gang Cafe did not disappoint, LuGang Cafe is famous all over Asia for their delicious dishes and fine cuisine, as it originated in China. As far as the place is concerned it was very pleasant to the senses, and you will never feel crowded because of the wide spaces that they have. One more thing to commend is that their service is great, even though they have only opened for a few weeks, everything was panned out quite well. Also try their set meals ranging from P 230 - P290, with choices such as Curry chicken, stewed pork, beef curry and Yakiniku beef, hope you do have a wonderful meal and enjoy it as much as I did. Oh!!! what are these yummy looking, wonderful treats!!! I have once checked online, looking for great treats to have as snacks anytime of the day... literally I was eating the whole day through. Just then, I stumbled into these marvelous treats, searching and scanning finally I was able to order and have first taste of this so called "Gigi's Custaroons". I was really wondering how it would taste like? Custaroons coming the words custard and macaroons, fused them together what do you get CUSTAROONS!! It is indeed quite a word, I think we have to tell Wiki about this, would you agree? At first bite, I was speechless, and then the second bite, all that came from my mouth was mmmmmm......., then I had to blurt it out!! Waahhhhh, it's so yummy!!! Now it's that time of the year again, so it's time for me to order these wonderful pieces of nature...a miracle that is called Gigi's Custaroons. I have been very lucky to have had a first taste of this wonderfully made square cakes, and yes I love them sooooooo much!!!! Cheddar is for those who love chewy cakes, while the butter rhum gives you a kick like no other!! Just the perfect treats this holiday season. The same good ol' care and loving made from the purest and best ingredients. Thanks to their delicious tapa. I have been itching to get back here since I had it a few months ago, since Rufo's famous tapa is not really near my side of town, I am always looking for restos serving tapas to lessen the crave, but in the end, it is still Rufo's that my heart wishes and what my stomach wants to churn on. Rufo's famous tapa boasts of their famous line, " Sauce pa lang, Ulam Na!" and yes I would say that is definitely true. the perfect appetizer, to that much desired famous tapa. The famous "topsilog:" known to all Filipinos as the most famous set meal ever since the 80's comprising of "Tap" for tapa (beef strips), "Si" for Sinangag (fried garlic rice) and "Log" for itlog (egg). We also tried their liempo - P98.00 which was actually good, it was tender and like all liempos fatty, so if you're tying to lose some weight skip this and get tapa instead. the chicken barbeque - P89.00 was a bit dry, even though it was smothered with ketchup and freshly cook and hot, this could still use some improvement so that the chicken is still juicy inside. Overall, it was fun to be eating at Rufo's again, what's good about it is that you get your fix and you don't hurt your wallet, prices are very reasonable and best of all, cheap!! Manila has been a melting pot of wonderfully delicious meals, that has been known to satisfy the palate of even the most discerning food enthusiasts. Chefs from the Philippines, have made names in the international scene, the best example would be the White House executive chef Cristeta Comerford, who has been appointed by Laura Bush, during Bush's Administration, and recently the administration of Pres. Barack Obama. 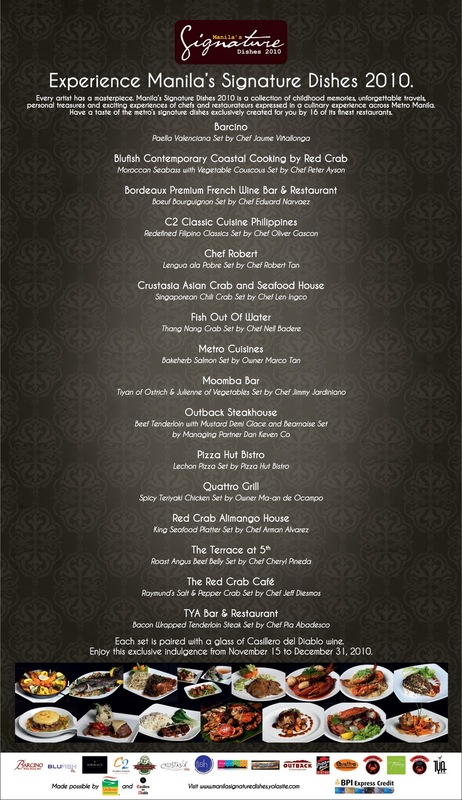 Join me as we visit the many chefs and many signature dishes of Manila. 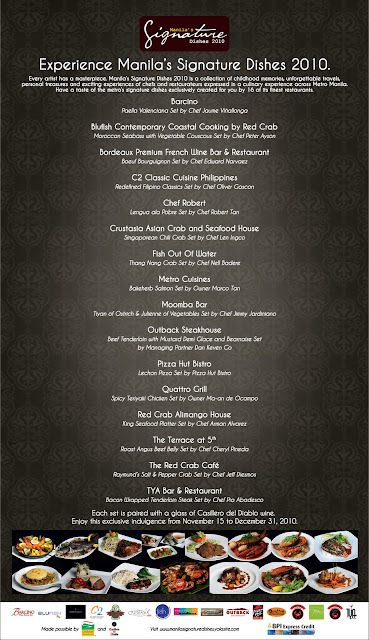 And let Manila be placed in the world map as one great culinary city. 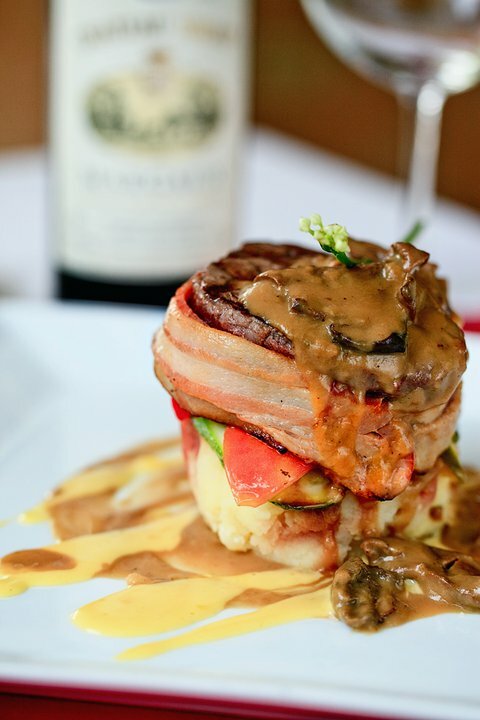 All these signature dishes are available in the market at their respective restaurants, a fabulous set meal paired with a glass of Cassillero del Diablo wine. Enjoy this treats from Nov. 15 - Dec. 31, 2010. This is brought to us by Unilever Food Solutions. Exclusive by credit card with BPI, payable by cash. This is my FREE CRISPY PATA from Max's Restaurant. I got it Free with the use of my BDO Card charge slip. 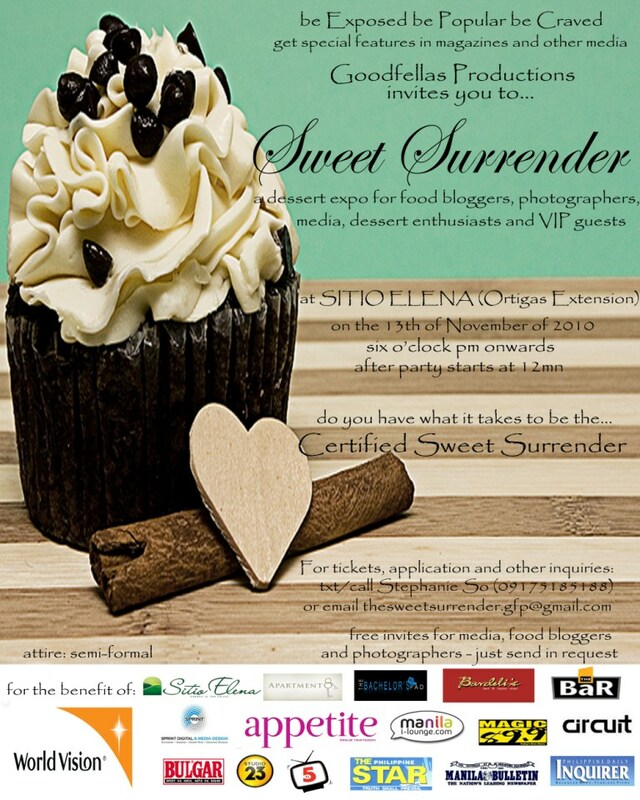 Click here to know how to claim yours now!! 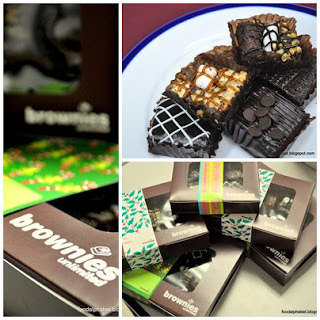 Brownies Unlimited, a brand we trust for more than 22 years, a pioneer in serving us fresh and delicious brownies everyday. What makes it the best is that they are prepared fresh daily, and delivered to all their branches daily(even the far reaches of Visayas including Cebu, Bacolod and IloIlo), now that is what I call dedication and total product perfection. I am proud to say that with their years of expertise on their brownies, you can be assured of their freshness and yes there are absolutely no preservatives, and kids just love them... not to mention parents and grandparents too!! And now, that Christmas is almost here, a fabulous way to bring smiles to your friends and loved ones, would be to buy a box of goodies and brownies, then gift them the joy of sweets. Only the best Cocoa goes in to each and every brownie, so that full satisfaction is guaranteed... soft, chewy and yummy! Perfect to the bite. Now to the exciting part, Brownies Unlimited loves you and would like you to have a very brownie Christmas, and a taste of being a Santa. 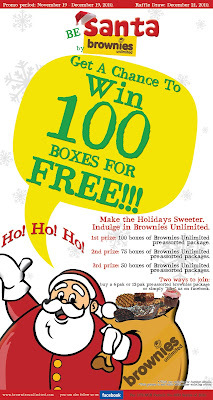 Get to win 100 boxes of brownies from Brownies Unlimited. 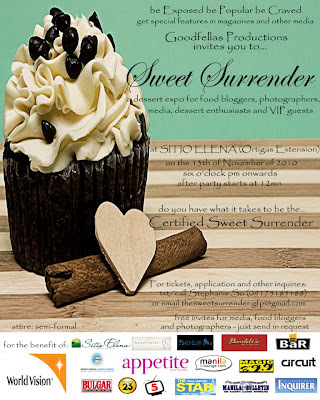 Simply "Like" their page on Facebook to receive a raffle coupon. Or Just go the store and buy a 6-pak for 1 coupon, and a 12-pak for 2 coupons. The more you buy, the more chances of winning. 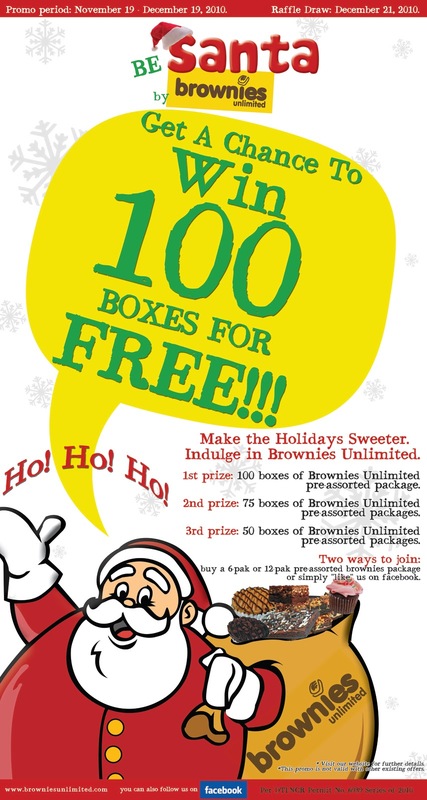 Who knows you might be the one to bring home 100 boxes of brownies from Brownies Unlimited. Promo period is from Nov. 19 - Dec. 19, 2010. Winners will be drawn on Dec. 21, 2010. After browsing at their menu for sometime, I think they really mean business.. Chicken business that is, and they are voted as America's Best chicken. So here they are bringing their famous chicken to our lands, and yes I am here... so stop looking at your computer and get over here, but wait you have to finish reading this post first... kidding!! First on the menu, Chicken Chops, P185. These Chicken chops are boneless, tender, juicy and delicious, you have a choice of Hot and Spicy or Soy Garlic, if you are a regular visitor of Taiwan, then the chicken chops you see here might be different to you. 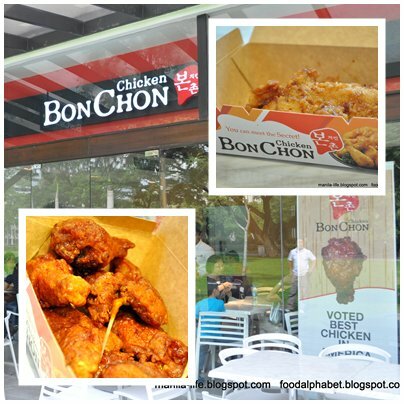 Well Bon Chon Chicken originated from Korea, it may have some roots from Taiwan but this is totally different from the ones you have tasted in Taiwan. They are coated with special sauces that makes them taste very flavorful. Oh No!! I can't differentiate the Hot and Spicy to the Soy Garlic one, maybe my tongue got too much punishment or they gave us all Hot and Spicy, or the spiciness from the other wings lingered on my tongue too much that I cannot taste the salty and sweetness of the Soy Garlic chicken.... ohh this is bad. Word of advise: Never order half-soy garlic and half-hot and spicy to be mixed together, as they may all look alike, and you won't know the difference between the two. I suggest just taking one flavor at a time, try the Soy Garlic first, then proceed to some adventure with the Hot and Spicy ones, and not the other way around or you would end up like me.... everything tastes spicy. Other than that mishap, the chicken should have tasted good, as confirmed by my blogger friends. So with that I promise there will be a next time. Another thing you must know, cooking time for the chicken is at least 15-20 mins., why? 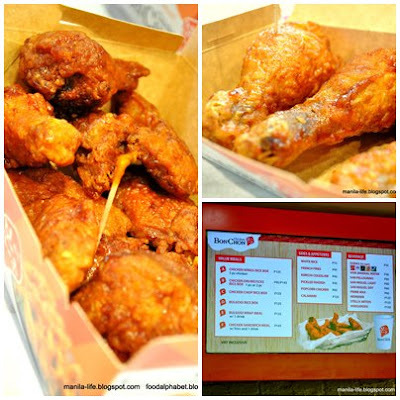 it's the quality of the chicken that has to be maintained, that is why they are deep fried fresh, or else it would not be Bon Chon Chicken. So if you are having your lunch break here, be sure you have extended time, or else you won't make it back to your office in time. One more thing, if you hate chicken, there is an option to order Bulgogi Rice Box P 125, which is basically Beef Bulgogi with some onions and garlic, but this is not why we came here to Bon Chon to eat right?? So stick to the chicken. I promise to come back again and order the Soy Garlic chicken only to get my fix somehow I was deprived off in the first place. Happy Eating! HCR is Hainanese Chicken Rice, in case you may not know. It is one of the most sought after dish in the world and is always a bestseller among restaurants in Singapore and Hong Kong. Restaurants in the Orient are sometimes ranked for how their HCR would taste, and here we have WEE NAM KEE, the best in Singapore now in the Philippines. 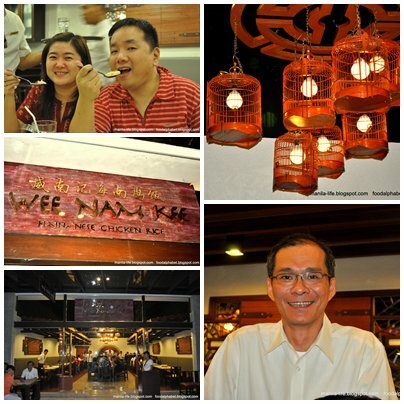 Wee Nam Kee, is already a household name in Singapore, and lucky for us we are their "first" store outside Singapore. Yes we are lucky indeed, and look what they have in store for us. Hainanese Chicken... as the saying goes the fatter the chicken the better it tastes, the juices that flow amongst the chicken is what makes the chicken ohh so delicious. And what is HCR without shredded ginger sauce. very delicious ginger sauce... a definite must dip with HCR. their mix of spices really brings out the taste of Hainanese Chicken, and don't forget to go with Hainanese Chicken Rice, as of picture time, I forgot to take some photos of it, as I was already busy munching...pardon me. But it was delicious! 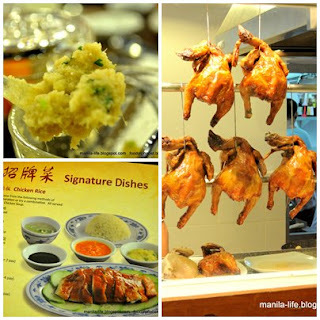 Hainanese and Roasted Chicken... both are delicious, the ooze coming out is just so delectable, don't forget to dip in ginger sauce as it will bring to your taste buds a nice combination of tender chicken meat and tastefully made ginger spices, yummy. Baby Kailan, was perfectly steamed to a crisp, topped off with garlic bits. really tasty and healthy as well. The Dumplings Soup, sad we were not able to try this as I love dumplings so much!! maybe next time I will get you, so be prepared for some punishment....hihihi. Overall my food experience at WEE NAM KEE is awesome. The food is great, but since it was a Pre-opening food taste it was bitin... and most of the menu was not available. I would do another blog post for WEE NAM KEE, when I get the chance to try it again, hopefully soon. WEE NAM KEE is now open to serve you. Since I can't wait for 11.14.10, I proceeded to KFC to find out for myself what this shamelessly, meaty from KFC is... and finally shazam!!! few minutes....and into my stomach. 2 (two) Original Recipe Chicken Fillet on top and on the bottom. How does it taste? Hmmm... one last look before I devour it. The first bite had me tasting the mayo, the tender chicken kicking in and the strong taste of cheese. The second bite, oh still heaven oh how I love KFC original recipe chicken flavor, then, just came to thought how about some KFC chicken gravy. Everything tastes great with KFC gravy. Ah yes! perfect.